We feel this trendy coastal resort captures the natural beauty and chilled atmosphere of Santa Barbara. Lying across the Gaviora Coast, days spent at The Ritz-Carlton Bacara are wonderfully indulgent, with stunning Pacific Ocean vistas around every corner. Santa Barbara is renowned for its laidback lifestyle, where surfers, avid foodies and sun-chasers unite to appreciate the tranquil ambience being by the sea brings. The resort’s blend of Spanish colonial architecture and cool Mediterranean décor will entice the most stylish of travellers in – this is certainly a place to be seen, a retreat for couples and groups of friends to enjoy the Californian routine of dining, relaxing and drinking wine by a firepit under the night sky. The rooms and suites are just as glamorous, with balconies, patios or wraparound terraces looking out onto lush views. The décor adopts a cool plantation style, letting the vistas and plush furnishings do the talking. The zero-edge pools and peaceful day spa offer sublime places to relax, whilst the opportunity to enjoy a horse ride, cycle along the coast or surf the waves arises whenever you desire. The restaurants do well to highlight the vibrancy of Santa Barbara, whilst also adopting the sophistication of the Mediterranean. Angel Oak is a beautiful steakhouse with a stunning ocean backdrop, serving only the finest of cuts alongside divine wines. For a more casual affair, nestle in for the evening at The Bistro, and enjoy a wood-fire pizza under the stars. The Pool Bar is the hotspot in the afternoons, with frozen cocktails and cosy seating areas. 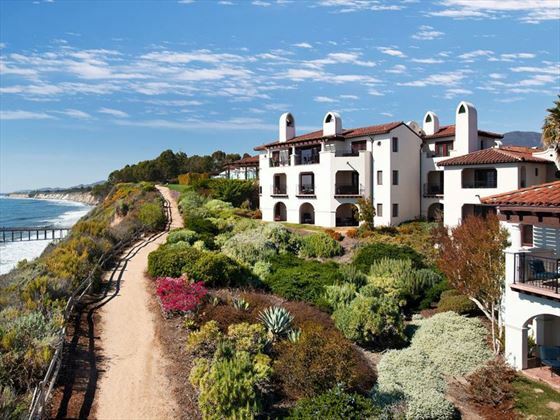 Nestled along the Gaviota Coast, a naturally beautiful coastline boasting powdery sands and lush greenery, this fabulous resort is clearly inspired by its quiet and secluded location. Spanning across 78 acres of the waterfront, you’ll be treated to two miles of tranquil beach. Deluxe One King Room – Cosy 42sqm rooms with elegant décor, featuring the standard amenities and lovely courtyard views. Deluxe Two Queens Room – Fantastic 42sqm rooms boasting two queen beds and courtyard views. Partial Ocean View King Room – Spacious 42sqm rooms, with the balcony or patio offering gorgeous garden views with a glimpse of the ocean. There’s the option to upgrade to Club Lounge Access*. Ocean View King Room – Inviting 42sqm rooms, this time with a patio or balcony boasting beautiful ocean views. There’s the option to upgrade to Club Lounge Access*. Deluxe Club Room – These lovely 42sqm rooms feature lush garden views, and also boast a fireplace and Club Lounge Access*. One-Bedroom Partial Ocean View Suite – Trendy 79sqm suites boasting a separate parlour with a sleeper sofa, a large balcony with partial ocean views, a wet bar, and a fireplace. There’s the option to upgrade to Club Lounge Access*. One-Bedroom Suite Ocean View – Divine 86sqm suites, boasting a large balcony with sweeping ocean views, a fireplace, a separate parlour with a sleeper sofa, a wet bar and two bathrooms. There’s the option to upgrade to Club Lounge Access*. One-Bedroom Suite Garden View – Uber-stylish 79sqm suites featuring a separate parlour with a sleeper sofa, a wraparound terrace overlooking the resort, two bathrooms, a fireplace and a wet bar. There’s the option to upgrade to Club Lounge Access*. Penthouse Suite – Sleek 140sqm villas, featuring two master bedrooms, a glorious wraparound terrace with ocean views, a kitchenette, a dining area and an office. There’s the option to upgrade to Club Lounge Access*. The Ritz-Carlton Villa – Glamorous 344sqm suites, boasting two master bedrooms, two living areas, two scenic ocean-view terraces, a kitchenette, a dining area and an office. There’s the option to upgrade to Club Lounge Access*. *Club Lounge amenities include: access to the exclusive Club Lounge, where you’ll be treated to food throughout the day including breakfast, lunch, afternoon tea, hors d’oeuvres and desserts, a Club Lounge Concierge, complimentary garment pressing, and a selection of Californian wines, beers, liqueurs, spirits and soft drinks. Angel Oak – A beautiful steakhouse that showcases culinary excellence, from the succulent certified Kobe beef, to the colourful seasonal vegetables. The 12,000-bottle wine cellar highlights how the perfect wine pairing makes a dish all that more special, and the elegant dining room and scenic patio both offer soothing ocean views. Opening times: 5pm-10pm. Bacara Bar – A cosy bar where you can enjoy a quiet pre-dinner tipple or nibble on gourmet sharing platters whilst enjoying the gorgeous ocean vistas. There’s also a terrace with a fire pit for those chillier evenings when you still want to feel the fresh salty air. The Bistro – This is the place to be if you’re hoping to relish a taste of Santa Barbara’s fresh local produce. The chef partners with nearby farmers and sustainable seafood sources in order to create a vibrant menu full of innovative bistro favourites, including brick-oven pizzas, hearty burgers and zingy salads. There’s a dining room and an oceanfront terrace, which offers direct access to the Pool Bar. Opening times: 7am-11.30am, 11.30am-4pm, 4pm-5.30pm, and 5.30pm-9pm (10pm Friday and Saturday). Blend – A charming coffee house offering delectable coffees, teas, smoothies and soft drinks, which can be enjoyed alongside tasty pastries and soft-serve ice cream. There’s even the option to grab a go-to order for a beach picnic or a long bike ride. Open 6am-7pm. Pool Bar – Surrounded by swaying palms and oozing Mediterranean-style glamour, the Pool Bar offers a fantastic menu of signature cocktails and frozen drinks, best enjoyed alongside a fresh bowl of guacamole or succulent fish tacos. The bar also has HD TVs, lounge seating, fire pits and cabanas. Foley Tasting Room – Taking place in the intimate and secluded 12,000-bottle wine cellar, this is your opportunity to learn about the area’s decadent wines and enjoy a high-class tasting experience. Wine tasting available 12pm-6pm Sunday-Thursday, and wines by the bottle and the glass are available 12pm-8pm Friday-Saturday. 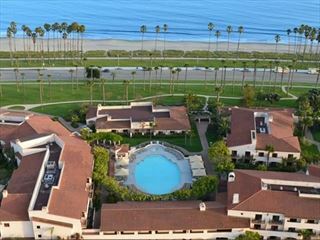 Set in a beautiful ocean front location, 20 minutes from Santa Barbara airport and a half-mile from downtown. Every room has a patio and balcony offering views of the resort gardens, Santa Ynez Mountains or Pacific Ocean.